The depth of expertise and experience in our specialist fields enables us to service bespoke or special projects that require expertise not offered by our competitors. Examples include specification and installation of multi-location airport noise monitoring systems, groundborne noise and vibration generation from operational railways, design and specification of vibro-acoustic mitigation for railway track systems, development of bespoke groundborne noise and vibration prediction models from underground construction activities, studying the causal effects of military test operations on nearby buildings at major UK MoD facilities, assessing structureborne noise transmission from major ventilation system upgrades, effects of waterborne vibration on fish habitats and occupied houseboats, numerical modelling of structures for vibro-acoustic responses. 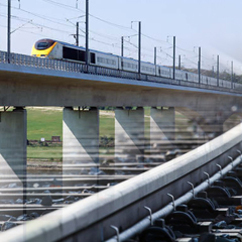 For the railway sector we are also specialists in the surveying and analysis of rail roughness, a key parameter in the generation of noise and vibration from rail systems. If you have an interest in our special project capabilities or would like to discuss your specific enquiry with an expert then please contact us for more information.